Cage Assemblies for most JVC Models are available from $289 to $419 for immediate shipping in Canada. 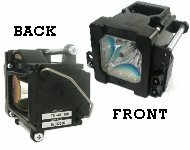 JVC lamps can be identified by TV Model number located at the rear of the TV. Known JVC Faults other than Lamp?